On Sunday there was a derby game – Roma vs. Lazio. Did not take too much notice of it. And I would’ve forgotten about it completely were it not for the ride back to the hotel. But first things first. Ambasciata di Abruzzo. Excellent aperitifs, good dinner. And the wine! A Cagiolo – Montepulciano di Abruzzo, thick and dark. As the restaurant was not exactly close to our hotel we had to take a taxi. This time it happened to be a small Fiesta. Four people managed to get in and then we started our ride. The driver was in his fifties, I think, with a long white beard (à la Nitsch) and with a blue woolen cap on his head. He needed a couple of seconds to figure out where we want to go. He turned the radio a bit louder as he was following the football game and excused himself but said he cannot help it. It’s a derby! He has to know what was happening. A minute later his phone started ringing and he fumbled with it, not really answering but also not having a conversation. And then another phone started and then, since I thought he was so maladroit with the portable devices because he was following the traffic (which was already cause for a couple of gasps) I realized he was actually concentrating on the radio and suddenly he turned it as loud as possible and almost stopped the car in the middle of the street. His phones landed on the floor, his cap flew away and he almost jump to his feet. Goal, goal, goal, goal… he’d yell his mantra and, hitting the steering wheel, would toot like crazy. At every crossing he’d repeat this and would try to engage the drivers of the other cars in his exhilarating happiness. He excused himself every now and then but mentioned he cannot help it. We almost flew with 90 km/h along the Tiber, through the small tunnels, between other cars and mopeds, quickly building up enough adrenaline to chase away whatever alcohol we had and sober us up almost completely. Dora Pamphilj – with Velasquez’s Innocent X in a small room, almost like a shrine. I would’ve liked to get closer… Two young Caravaggio, Breughel the Older, etc. etc. The whole palace is stuffed with paintings and some of them quite good. Doors were open to the apartments where (apparently) the offspring of the Pamphilj family still live today. A bit uncanny to see the old furniture and carpets, marble tables and, almost provocative, here and there, a book or a cd. Do they really live there? National Gallery of Modern Art – I think a visit to a foreign country has to include a visit to the national gallery. The way the paintings are displayed, the kind of paintings hanged on the walls, the kind of paintings being made by the artists of this country, the play with the light and colors – all of this should be enjoyed and sought after as one enjoys and seeks the local food and wine. Anyhow, there could’ve been ten times more paintings there. There is enough art in Italy! Ripa12 – amazing fish food (from fish Carpaccio to tuna Carbonara). Da Gino – very small and almost hidden (thank you S.!) with great food, kitschy decorations and perfect atmosphere. 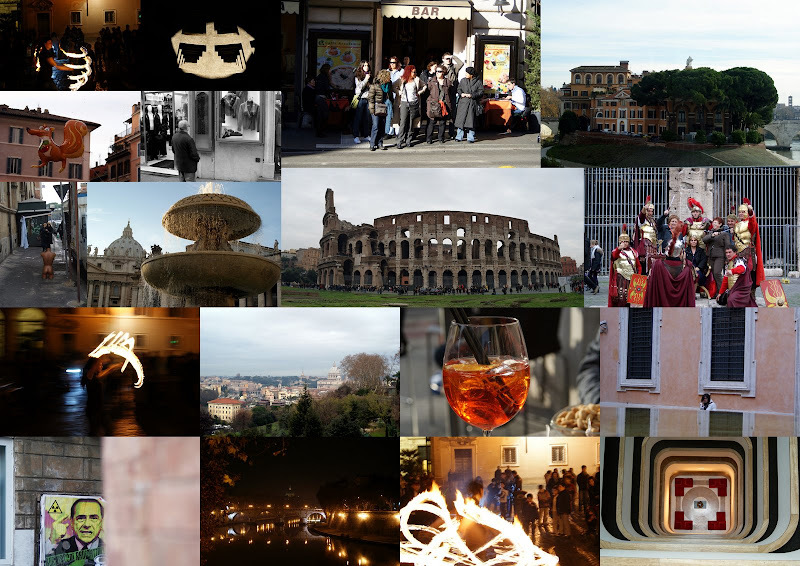 The list could go on and on… espresso, Aperol spritz, running after buses, parading on the streets, pizza alla romana, more Aperol spritz, an occasional Campari, Castroni, carciofi, swarms of starlings, bresaola, Trastevere, eating chestnuts on the Spanish steps, Tiber at night, St. Peter’s square with perfect evening light, foggy view of the city from Gianicolo hill, etc. etc.